ACES’ Rock Bottom Ranch holds a pork butchery demonstration Tuesday. It's meant to help everyday consumers understand more about where their meat comes from. Tonight a side of a whole pig will be butchered into familiar cuts like pork chops and bacon, as well as what’s called “primal” cuts. Jason Smith is the director of Rock Bottom Ranch. 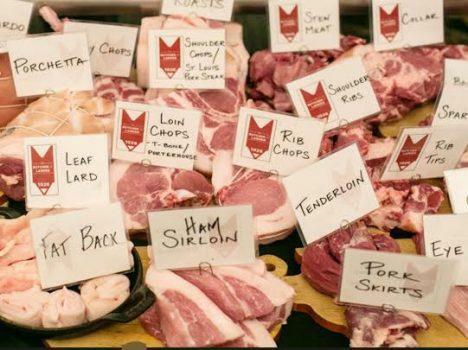 He says that helping consumers understand butchering practices leads to a greater connection to our food. "We start to realize that the whole animal looks a whole lot different than just the individual pieces," he said. Smith says the event will also focus on how different cuts can be prepared, and why cuts may be suited to a certain cooking method. For example, pigs use their shoulders a lot, and so pork shoulder is stringy and tough. "So we need to prepare that in a different way than say the loin. You know, pigs are not really doing sit-ups, and so that’s a really lean muscle," said Smith. The demonstration starts at 6 p.m.
Heritage Fire culinary festival was Saturday in Snowmass Village. The event featured whole-animal cookery over open fires. There’s also a larger purpose: To spread education about local farmers and sustainably raised meat. Arts and culture reporter Christin Kay took a trip from farm to table, or, in this case, farm to fire pit.